Sometime in the last few years I came across these photos of my grandmother. Likely it was when I was doing genealogy many moons ago. My guess is the photos were taken in the late 40s or early 50s, maybe a little later than that, but they represented my grandmother well. She passed away this morning. Ironically it was gardening that started her down the path that put her into the nursing home she was at the end; a fall several years ago in her garden when she went out to water at her house ended her gardening days. Even as long as a few months ago she was still wishing and hoping to go to a different assisted living place, to have a taste of freedom once again, but her mental capacities were waning. 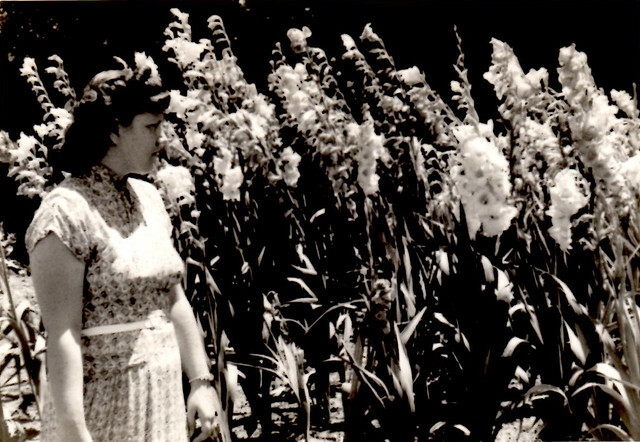 My grandmother was definitely a gardener and a lot of my memories growing up and visiting her house involve being outside a lot. My brother and I would run around the yard playing games while she would water, fertilize, or pick fruits and vegetables from her garden. There’s so much here that I’m now remembering that I will have to write about soon, so many silly things like cheap flip-flops from K-mart on the cement steps to her house, or how she locked the back door of the house even though we were in the back yard and could see the door…she was always afraid of someone breaking in and she lived in a bad neighborhood. Of course she had a good reason for her fear, my grandfather died of a heart attack/fright when someone broke into their house when I was a year old. I don’t think I can adequately explain my grief here at the moment but I did want to write my post today and to somehow memorialize my grandmother. I looked for a rose blooming in my garden but none were blooming (thanks deer), and so I remembered these photos in my studio. 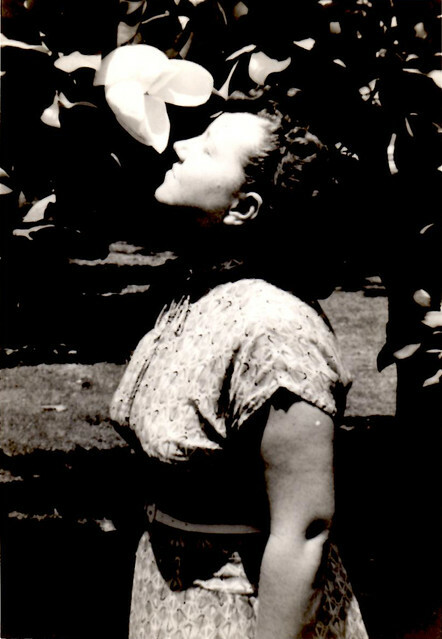 I love the profile pick of her smelling the flower, it looks light the bloom is shining a light on her face. I can see your Mom’s profile in her as well. I still can’t get over how much your mom looks like her. Again, I want to express just how sorry I am that you all are experiencing this. Please know that we’re thinking about you all.